LC27901 Features: -Peek a boo forest soft book.-Flexibility of the mesh adapts to baby's body, distributing the weight of the torso evenly, minimizing the pressure on baby's abdomen.-Sun self-discovery mirror, tractor teether, and crinkly corn.-Makes tummy time fun and comfortable.-Mesh cover and mat are machine washable. Color/Finish: -Ends of play, bright colors and large, friendly animal eyes invite baby to focus on a single object, supporting healthy eye development. 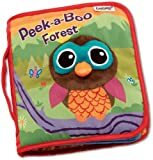 The Peek-a-Boo Forest book (designed for ages 6m+) is very cute. Has very bright colors, and peek-a-boo flaps that lift away on each page to reveal a cute animal (e.g. move the tree to see the moose, move the leaf to see the owl, etc.). There are five two-page spreads – each asking “Who is hiding behind the [tree or whatever]?” on the lefthand side, then revealing an animal beneath a crinkly flap on the righthand side. The featured animals are a moose, an owl, a bear family, a raccoon, and a beaver. The front cover also features a bird with a raised, fuzzy, crinkly face. Between the bright colors, the repetitive peek-a-boo activity, and the simple text, this seems very age-appropriate for my 6mo old. And more importantly, he agrees – he loves it! 0m+ How do I Feel? Soft, colorful book with crinkly peek-a-boo pages. My 3.5 month old hasn’t been interested in too many of his toys yet, but he did take to this book immediately! While reading I can see his interest in the colors and the crinkly noise the peek-a-boo pages make. The book is light enough for him to hold and he enjoys putting the pages in his mouth. Cute book and I’m glad he liked it!